The autonomous entity of Bosnia and Herzegovina, the Federation of Bosnia and Herzegovina, has its own public holiday, Statehood Day, that isn't celebrated in the Republika Srpska. This holiday annually falls on November 25. 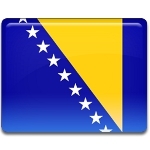 The politicians of the Federation of Bosnia and Herzegovina chose November 25 as Statehood Day to commemorate the day of adoption of the resolution, declaring that Bosnia and Herzegovina is an equal community of Serbs, Bosniaks and Croats. This resolution was adopted in 1943, when Yugoslavia was occupied and divided between Germany, Italy, Hungary and Bulgaria. There are still many political controversies regarding the celebration of Statehood Day in the Federation. It was very hard to chose an exact date for commemoration, since many of them are important for the nation. At the same time the representatives of the Federation don't recognize the celebration of General Framework Agreement Day on November 21 as the national day, and vice versa. That is why Statehood Day on November 25 is still contested.